On Friday evening, 19th June 2015, I attended “an unique event to mark an amazing iconic moment in time” hosted by Leica Store Manchester. Vietnam AP Photographer Nick Ut photographed Kim Phuc after a napalm strike and produced one of the most unforgettable images of the 20th Century. Together in Manchester, they officially ‘opened’ the new Leica Store and talked about the events of the memorable day the photograph was taken, and about the way it has affected their lives ever since. As well as being an influencing factor responsible for the end of the war, it was obviously a pivotal part of both their lives and one which had huge personal repercussions. Today Kim, who now lives in Canada, has a charity, The Kim Foundation International, a non-profit organisation whose mission, as might well be appreciated following her own experiences, is to help heal the wounds suffered by innocent children, and to restore hope and happiness to their lives, by providing much needed medical and psychological assistance. Nick can be seen here. Sean Sutton from MAG International also gave a preliminary talk, and photos from Mag and Nick showing their work and various projects that MAG are involved in around the world were also on display. Mag International’s vision is a safe and secure future for men, women and children affected by armed violence and conflict. 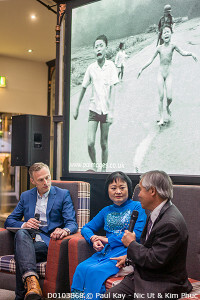 The evening was a fascinating insight into a piece of history which I remember happening – although I was then just a youngster, the images in both papers, and on the television, of the Vietnam war were quite startling and left an impression. Whilst now quite well known, Nick and Kim’s story was very well worth retelling and listening to. Although I have never had the remotest interest in photographing the horrors of war myself, to listen to people who have been involved in one of its most appalling, widely reported and influental events was quite something and well worth a 100 mile drive. Dr Andreas Kaufmann, Supervisory Board Chairman of Leica AG was also there and was not merely courteous enough to have a chat with a lowly photographer, but most charming and pleasant too. An interesting evening, and many thanks to David Stephens.